Can you believe it is almost September already! Our summer break was terrific but we are ready to get back into the swing of things. Very excited to open up two new shows this month with Stewart Harvey and Graham Schodda. We just sent out our monthly gallery email newsletter. In case you are not on our email mailing list, you can read it here. See you soon for some very cool characters. It’s hard to believe that we are working so hard right now on our late September/October show. How did it get to be so late in the year already! 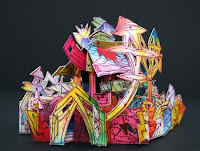 The first pop-up book for the show arrived today. Unpacking the books for a new show is always a little bit like Christmas. One of my favorite parts of my job. We finally have a list of prizes prepared for the Pop-Up Now show. The jurors will arrive in Portland for the Movable Book Society conference on Thursday, September 23 and will come visit the gallery to choose which books will get the prizes, which will be awarded at a special reception for conference attendees on Friday evening. Two “Best of Show” winners in the categories of best limited-edition book and best one-of-a-kind book will each receive a copy of the Movable Book Society 10th Anniversary Special Limited Edition boxed set, which contains pop-ups and movable reproductions from some of the most famous historical creators in the field. This highly sought-after collectible is being donated by two of our jurors from their own personal collections. My own copy of this piece has served as inspiration for my work many, many times. You can see a video of this work here. Or see it listed on Robert Sabuda’s web site here. I just did a search for it and found one dealer who has it listed for sale for $550. What a cool prize! 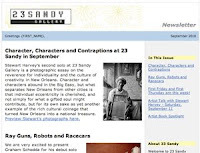 One artist will receive the “Gallery Choice Award” and will receive a solo show in the book room at 23 Sandy Gallery to be scheduled sometime in 2011. Three artists will receive “Juror’s Choice Awards” of a free one-year membership to the Movable Book Society. Now comes the hard part of choosing the winners. The jurors have their work cut out for them. There are just so many great works in the show that it could take them hours to decide. Image: Enchanted Garden by Paul Johnson. Just one of the many fabulous books you’ll see in Pop-Up Now! 11 :00 a.m. – 5:00 p.m.
23 Sandy Gallery is pleased to be a part of this very fun fair again this year. A big tent in a parking lot near Em Space will be the site for the always-popular event. 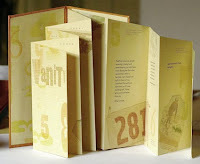 We’ll bring a selection of letterpress-printed broadsides and artist books from gallery inventory. All the info plus a map to the location can be found here. Image credit: Vanity: I Wanted to be a Bicycle Racer by Rebecca Chamlee. The only downside to owning a gallery is that you never get to join the party! Finally, a chance to get out and see some great art on what promises to be a clear, warm summer evening. Don’t forget to stop in at Nine Gallery to see Renée Zangara’s gorgeous show. You Really MUST See This Show! First Thursday, August 5th, 6 – 9 p.m.
Renée Zangara Studio is pleased to announce a solo exhibition of the artist’s latest work, Wishing Well, on view at Nine Gallery August 5 – 29, 2010. The space will be transformed into a surreal landscape that invites viewers to consider the purpose and potential of forces that often go unnoticed. Zangara is known for her exaggerated portrayals of isolated images. 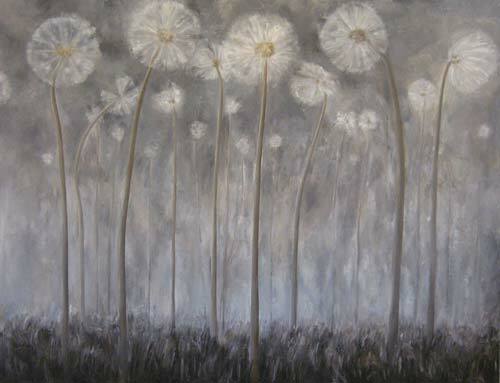 At Nine Gallery, she will present four large canvases that depict a panorama of larger-than-life, kinetically charged, ephemeral dandelions. Their oversized scale and the physicality of paint application contradict the spare landscape and implied delicacy of the seed crowns. The result is a psychological tension that alludes to the artist’s exploration of the powerful, yet often unrecognized, energies inherent in all matter. Renée Zangara has been an active member of Portland’s art community for nearly 15 years. Her work has been exhibited nationally and regionally, and is in numerous private and public collections, including the Regional Arts & Culture Council’s Visual Chronicle, Oregon Health Sciences University, and Oregon State University’s College of Agricultural Sciences, among others. Zangara received a Bachelor of Fine Arts degree from Marylhurst University and is a member of Nine Gallery. In September 2010, her work will be featured in the PDX Window Project at PDX Contemporary Art. For more information about the artist and her work, please visit www.reneezangara.com. The Nine Gallery is housed inside of Blue Sky Gallery at the DeSoto Building, located at 122 NW 8th Avenue on Portland’s North Park Blocks. Gallery hours are Tuesday – Sunday, 12 – 5 p.m.
For more information you can reach Renée at: contact@reneezangara.com or 503.927.4337 . Do you have a special skill in art or crafts that you would like to share with others? The TaborSpace web site is www.taborspace.org. They are not able to respond to individual questions about the two events, but the web site gives a good idea of what is offered there. All inquiries should come to Judy at devineart1@me.com.